I’m first going to give a general overview of the phenomenon and then trace its roots by introducing the concept of probability masses and probability densities. Though the first part is going to be fairly intuitive, the second part is going to be a bit heavy on the math side. There are only 2 possible outcomes. One of them is heads. Therefore, the probability of heads is 1 out of 2, or 1/2. By the same logic, the probability of rolling a 4 with a 6-sided die is 1/6. The probability of drawing the jack of diamonds from a standard 52-card deck is 1/52. You get the idea. The logic here is simply to divide the number of outcomes that satisfy an event by the total number of possible outcomes. If an outcome isn’t in the set of possible outcomes, by definition it can’t occur. For example, you can’t roll an 8 with a 6-sided die. This means that P(“Roll 8”) = 0. The zero in the numerator comes from the fact that exactly 0 of the six possible outcomes are 8. Have you noticed a contradiction so far? In the beginning I said that a probability of zero doesn’t imply an outcome is impossible to occur. But just now I implied that impossible outcomes always have a probability of 0. What’s going on? The apparent contradiction is resolved by noticing that I approached the question from two different directions. 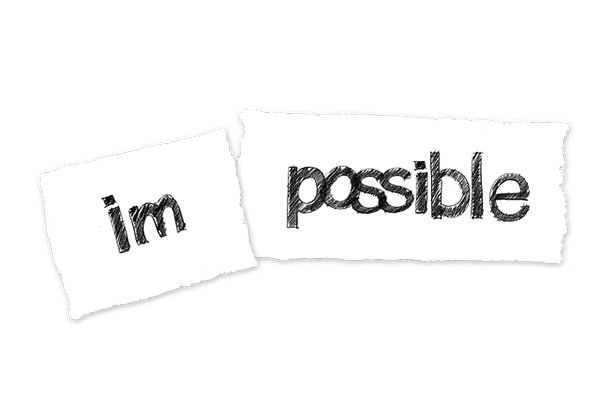 It’s still true that impossible outcomes have a probability of zero. What is not true is that zero probability outcomes are necessarily impossible. So, how can an outcome be possible, yet have a probability of zero? You can’t come up with any examples while staying in the realm of finite sample spaces. On the other hand, in infinite sample spaces, possible zero probability outcomes are abundant. A sample space is simply the set of all possible outcomes of some randomness or uncertainty. A finite sample space is one which has a finite number of possible outcomes. An infinite sample space has an infinite number of possible outcomes. The simplest example of an infinite sample space I can think of is that of randomly drawing a number between 0 and 1. This sample space is infinite because there’s an infinite number of real numbers in the interval [0, 1]. So, what is the probability of drawing any specific number from this interval? Do you already see a problem with applying the probability calculation logic from the previous section to answering this question? Because there is only one of each specific number in the interval, the numerator in the formula is still 1 . But when you try to divide this by the total number of possible outcomes, you suddenly find yourself in the situation of dividing by infinity. Clearly the answer to the last expression can’t be any positive real number. That would imply that the denominator was actually a finite positive number too, but we know it’s infinity. But you can see that, as the denominator approaches infinity, the entire expression approaches zero. Therefore, if we’re going to attach a number to the last expression, zero seems like the most natural choice. Notice, we have a probability of a possible outcome and it’s equal to zero. Voilà! Of course, this is an informal explanation and you’re not truly satisfied with it. You can’t really divide a real number by infinity and this was only meant to give basic intuition. Furthermore, it still doesn’t really explain why possible and impossible events can both have a probability of zero. I’m going to address these questions in the rest of this post. But before that, here’s a small intermezzo to clarify something that might be bugging you. Why are we considering specific values? Remember, we’re talking about drawing this very exact number. If you draw 0.38750001, it doesn’t count. If you draw 0.387500000000000000000001, it still doesn’t count. It has to be exactly 0.3875 (with the optional infinite trail of zeros). You might think I’m being picky. If the drawn number is close enough to the original number, shouldn’t we consider that a success? You can do that, of course. You can still count it as the same number if it’s less than or greater than the original number by a very small amount. But then you would essentially be dealing with intervals, not exact numbers. If you break down the the entire [0, 1] interval into sub-intervals, no matter how small, you will transform the problem to one with a finite sample space. And we already know how to calculate probabilities for those. To understand infinite sample spaces, one needs to be familiar with the concept of density. Here I’m going to define it with physical examples and later use it to explain probability densities. In physics, the average density of an object is the total mass of the object divided by its volume. So, if you have a metal cube whose mass is 1000 kilograms and whose volume is 2 cubic meters, its average density is going to be equal to 1000 kg / 2 m3 (or 500 kg/m3). Because it’s easier to visualize, instead of a cube, imagine a metal rod whose mass is 1 kilogram and whose length is 1 meter. If you want to push your imagination even further, think of it as having no width or height… It’s simply a 1 meter long infinitely thin rod. Keep this in mind, as it’s going to be very useful in a bit. If the mass is uniformly (equally) distributed along the rod, then each of the 100 pieces will have 1/100th of the mass (10 grams). But it could also be that some pieces are more densely packed and have a higher percentage of the mass. For example, the first 20 pieces could be 25 grams each, and the remaining 80 could be 6.25 grams each. In other words, by multiplying each piece’s length times its density and summing over all pieces, you obtain the total mass of the rod. This should be pretty intuitive. Now each piece has an even smaller fraction of the total mass and length. But we can just as easily calculate the density at any piece or the total mass by summing the density*length products over all pieces. No matter how small non-overlapping pieces we break the rod into, their number is always going to be finite. But what if we break it down to points? You will remember that points are idealized zero-dimensional objects. This means they have 0 length, height, and depth. If that’s the case, what would we get if we tried to calculate a point’s mass with the formula length*density? Multiplying any density by 0 will always give 0. Hence, summing all points’ masses will give 0 as the total mass. But we know the rod’s mass is 1 kg, so there’s clearly something wrong here. Those of you familiar with integrals are probably already nodding with a half-smile. Unfortunately, a detailed introduction of integrals is also beyond the scope of this post, so we’ll suffice only with the general intuition. The thin S-like symbol is the integral sign. The 0 subscript and 1 superscript mean that we’re integrating (“summing”) from 0 all the way to 1 (from the first to the last point of the rod). The term density(x) represents the density at a particular point x and dx is the infinitely small interval in x I mentioned above. Another way to think about integrals is as the area under the curve that represents the function you’re integrating. The reason is that summing all these infinite products is like adding up an infinite number of rectangles whose witdhs are dx and whose heights are the values of the function at each point. The important (and counter-intuitive) thing to get out of integrals is that you end up getting a finite number by summing an infinite number of such products. Taken individually, each of the infinite terms contributes 0 by itself, but together they amount to a finite number. And with all this in mind, let’s go back to the domain of probabilities. In probability theory, the term probability mass refers to the familiar notion of probability. The entire sample space has a probability mass of 1 and the amount of probability mass of a subset of the sample space corresponds to the probability that an outcome of that subset will occur. In infinite sample spaces, probability density is the probability mass divided by unit length of the sample space (I’m using the term length here very loosely). 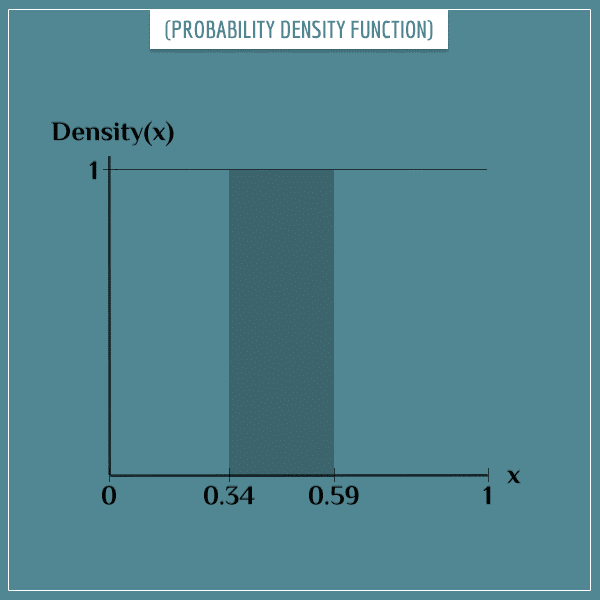 Similar to physical densities, probability densities can be defined at every point of the sample space. 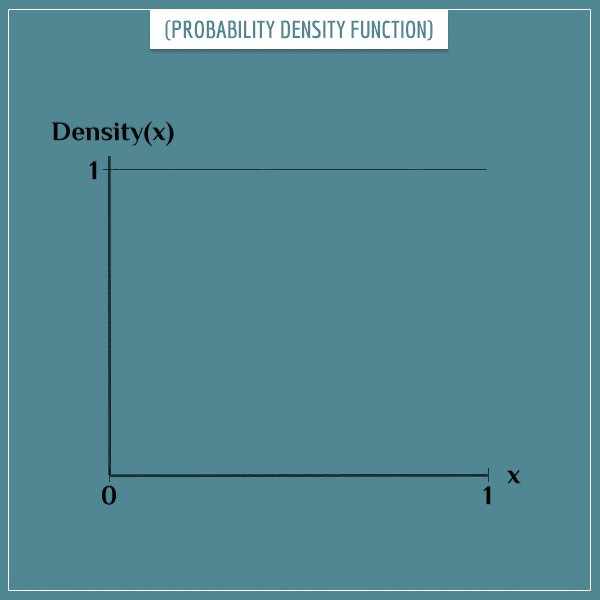 This function gives the probability density at each point in the sample space. Notice that each point’s density is equal to 1. A common beginner’s mistake is to read probability density functions like one would read probability mass functions. Namely, to interpret the number corresponding to a point as that point’s probability. Just from this example you can see that this interpretation is wrong: it’s certainly not true that every point has a probability of 1 of being randomly selected! To get probability mass out of a probability density, you need to multiply the latter by some interval from the sample space. As we saw in the previous section, if you take the density at any particular point and multiply it by the point’s length, you would get zero, since points don’t have length. You obtain this probability mass by integrating over the probability density function from 0.34 to 0.59. As I said in the previous section, you can think of an integral as an area under a curve. In this case, the curve is a straight line. The probability that the random number is in [0.34, 0.59] is the area under that line bound between these two values. Well, that area is equal to a rectangle of height 1 and width 0.25, hence the final probability. Bottom line is that, when dealing with infinite sample spaces, it makes sense to talk about probabilities (probability masses) only for intervals, rather than exact values. For most real-world applications, a small enough interval around an exact value could be considered identical to the value itself (for all practical purposes). But still, know that exact values always have probabilities of 0. There is still some element of discomfort in the notion that zero probability outcomes occur in the world. After all, outcomes are concrete values, not intervals. And why do we say the probability is 0 if the outcome can occur, after all? What can we make out of the fact that something that just occurred had a probability of zero just an instant before it occurred? Here the probability theory notions of of almost surely and almost never come to the rescue. An event happens almost surely if it has a probability of 1. And it happens almost never if it has a probability of zero. The “almost” is there precisely to acknowledge the fact that, in infinite sample spaces, 0 doesn’t imply impossibility and 1 doesn’t imply absolute certainty. It implies that, for all practical purposes, in any individual “trial”, a zero probability event will not happen and an event with probability 1 will always happen. I focused most of my attention to “almost never” events. But “almost surely” events are very similar. For example, if you exclude any specific number from the set [0, 1], the probability of drawing a number from the newly created set is 1, even though it’s still theoretically possible to draw exactly the excluded number. As you can see, the two notions are tightly connected. Unless you decide to specialize in certain theoretical fields, this post doesn’t have too many practical implications for whatever purposes you have in life. My main goal was to give an intuitive explanation for the curious cases of possible events that have zero probabilities and events with probabilities of 1 that may still not happen. In finite sample spaces, zero probability events are impossible and impossible events have zero probabilities. Impossible events have zero probabilities AND zero probability densities in infinite sample spaces. In infinite sample spaces, a probability of 0 by itself doesn’t imply an event is impossible to happen. It implies it will happen almost never. In infinite sample spaces, a probability of 1 by itself doesn’t imply an event will happen with absolute certainty. It implies it will happen almost surely. I also gave a short introduction on probability masses and probability densities and their relationship through integration, in order to give the intuitive reasons why the 4 statements above are true. These concepts are extremely useful in virtually all fields that use probabilities, not just for explaining curious cases like the ones here. If you have more clarity on them now than before you read this post, then you have gained valuable insights in probability theory you will find helpful while trying to understand more complicated concepts. Hi Tuan, thanks for writing! The density function isn’t necessarily equal to 1. In fact, most of the time it isn’t. The “sum” (integral) of all probability densities is equal to 1 because the sample space must have a probability equal to one. Does this partly answer your question? I’m not entirely sure which part of the post you’re referring to. Could you cite the paragraph you’re struggling to understand?